The wonderful Dawn from Dawn’s Inspirations is back and this time she is showing us how to create pretty cards with metallic foil detailing. Keep reading to see how this quick and easy technique takes your papercraft projects to a new level! Want to try this technique for yourself? Our Foils and Transfers are currently in our fabulous End of Summer sale! Shop now! 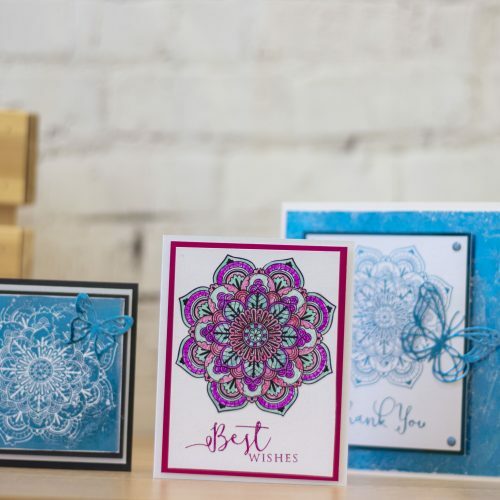 Sit back and enjoy this video, in which Dawn shows you how she created these lovely designs! Cut out mandala shape and sentiment from transfer sheets. Peel off backing an attach to your Centura Card rubbing down with the popsicle stick in the pack or by running through your Gemini. Now carefully remove top sheet of transfer and lay over the foil and cut to size. Again rubbing down with the popsicle stick in the pack or by running through your Gemini. Matt and layer this to your Ice Blue Mirror Card. Colour your gems with the metallic pen and attach these once they are dry. Using your waste foil stick this in an On/Off method to your Self Adhesive Centura Pearl. Die cut a butterfly out of foil covered card. Now assemble your card using 3D Glue Gel to mount the main image. DON’T throw away any waste pieces of Foils and Transfers from this project you can also create extra cards. Here are just a couple I made on the video. Our End of Summer sale ends soon! Shop now and add pretty metallic foiling to all your crafting projects!